La Salle star Pookie Powell shoots in the first half of the La Salle’s loss to Lafayette on Saturday. 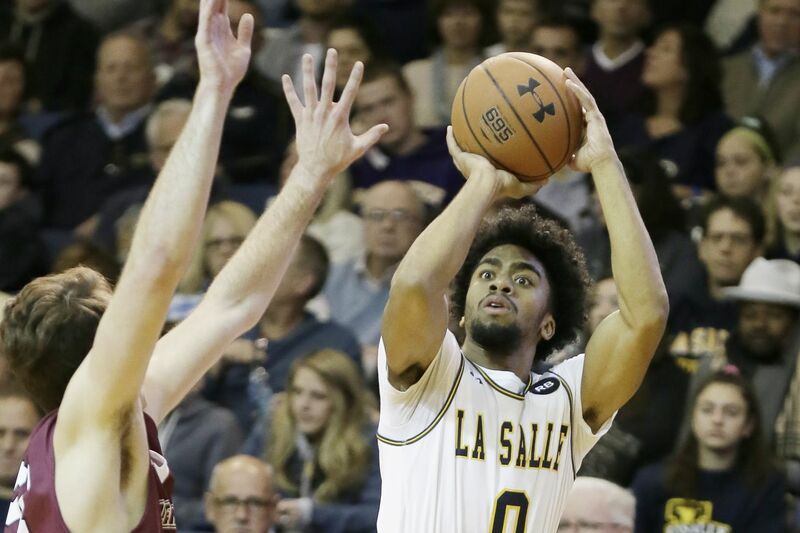 For La Salle star Pookie Powell, there was pain in knowing that his 26 points were one short, after his last contested shot didn't fall in the final seconds Saturday afternoon at Tom Gola Arena. It was a game destined to be decided by a shot that would spin out at one end, and one that would spin in at the other. That's the way it played out, with a foul added on, providing Lafayette the final margin. "Tough loss, just for all the obvious reasons,'' Howard said, quickly adding that he was proud of the way his guys had battled. "The more opportunities we get to be part of close, deciding games like this, the better it's going to make our team." Powell's 26 points included four three-pointers, but also from plays such as when Powell followed two straight misses late in the second half, getting the ball off the rim himself, including after a three-pointer, scoring each time, getting La Salle in front. The hero for Lafayette was guard Alex Petrie, who drove, saw his shot spin in, and got fouled by David Beatty with 10 seconds left. His free throw added the final point of the game. For Lafayette, (1-1), coached for the 24th season by Fran O'Hanlon, Myles Cherry had 18 points inside on 9 of 10 shooting, while three guards — Petrie, Kyle Stout, and Justin Jaworski — combined for 40 points. In the first half, Lafayette had 10 assists — on 10 made baskets — to five for La Salle. However, Lafayette also had 13 turnovers, to five for La Salle. So both teams were giving each other trouble in different ways. The Explorers finished with just seven turnovers, to 17 for Lafayette, which meant La Salle got eight more shots, but made two fewer. Just as it did in Tuesday's season opener at Temple, La Salle had rebounding issues, losing the battle by 42-30. Expect this to be a season-long issue for La Salle, since Lafayette's big men were only going 6-8 and 6-7. That was more than enough to cause problems for La Salle's perimeter-oriented team. The way Howard saw it, his guys scrambled around trying to contest shots and create turnovers and then had difficulty getting in rebounding position. The new Explorers coach also thought the biggest defensive issue was getting matched up with all of Lafayette's shooters in transition.